Latest advice from the War Department indicates that Marine Panther, originally scheduled to arrive in Calcutta about May 3, may now arrivwe around April 30, a Theater spokesman said this week. Under these circumstances, original plans to hold the Panther until May 7 to follow the departure of the Marine Adder on May 5 may have to be altered. At presstime, no definite information as to what extent this will affect the May shipping dates was available as War Department approval of any change in plans has not yet been received. With the closing of Camp Maidan this week, the home of Headquarters Company, Base Section, for almost two years was moved to Camp Dhakuria where it will remain until Theater closing and absorb other Base section units. Camp Maidan had proved an ideal location for the Headquarters Co. men because of its easy accessibility to the Hindusthan Building and its central location to the small nite life of Calcutta. Maidan, under the command of Capt. Robert MacHugh boasted of the first indoor basketball court and the first tennis court. The monthly Headquarters Company outdoor dances were always a notable event and culminated in a gala banquet at the British and American Clubs. Camp Maidan will be taken over the the British Corps of Military Police. Headquarters Co., now at Camp Dhakuria under Lt. Norman Ross, has given up the city existence to partake in the relaxation the country has to offer: horse shoe pitching, boating, ping pong, etc. - and for those men who have greater attractions in the city, semi-hourly bus services are available until 1 a.m. The famous Lindsay Street, headquarters of the 275th Military Police Co., has also closed down and the men are now billeted at Camp Dhakuria. The 275th expects to be de-activated soon and a small residual detachment of military police will be absorbed into Headquarters Co., Base Section, to carry on MP activities. DUNKING DARLING Care for a dunk? 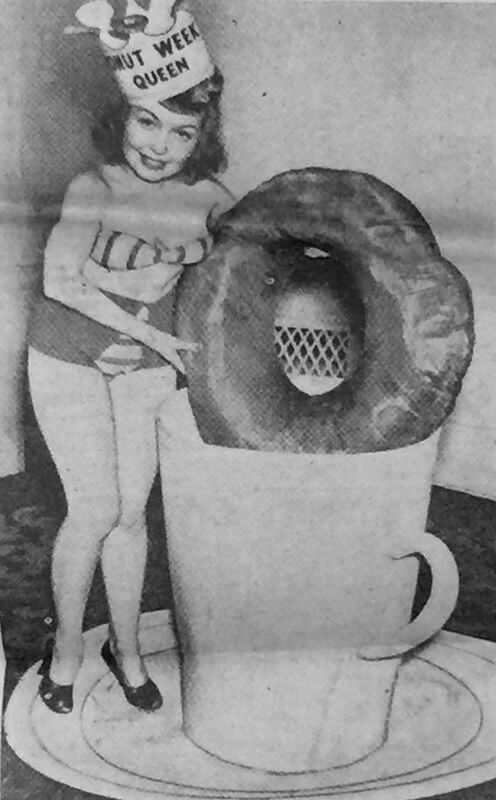 Cute Darleen DeMos has been named "Donut Queen" of 1946. This makes about the fourth time little Darleen has appeared in Roundup's pages, but do we hear any objections? Theater APO's Have Big Sales Chota Roundup Article Though the theater strength was greatly reduced during the month of March, enlisted men and officers alike bought 6,267 money orders totalling $373,226.39. During the same period 2004 money orders were cashed. In that transaction $89,520.93 was handed over the counters. Base Section (APO 465) sold the most money orders, 1214; and also cashed in the most, 714. 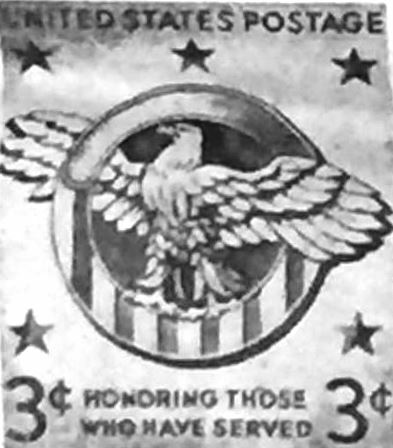 With regard to registered mail, 1,976 registered letters were delivered to men in the Theater and 2,445 were mailed to the U.S. Only 16 insured letters and packages were delivered, while 964 left the Theater atatesidebound 606 telegrams were also dispatched to men during the month. NEW DELHI - (UP) - To report to the U.S. Government and people the facts about the Indian food situation, ex-President Herbert Hoover arrived here from Karachi this week, and at once proceeded to the Viceroy's House for conferences with the Viceroy and high-ranking officials of the Government of India. Mr. Hoover was met at the Willingdon airport by the Military Secretary to the Viceroy, Col. D. H. _________ American Commissioner, Maj. Gen. Vernon Evans, and other senior American officers. Mr. Hoover said he would remain in India for six days. From there he will go to China and Japan. The morale thermometer fluctuates more in a few hours on Saturday afternoons at the Tollygunge Race Track than the weather thermometer does the entire year. At the track, interdispersed throughout multitudinous crowds in white dhotis, seersucker greys, printed saris wrapped around lovely frames, the GI in his khaki stands clear. Everywhere he is waiting anxiously for the "Hot tip," in other words, as much information concerning the horses and jockeys that will help him choose the winner. After a day at the races, we interviewed the only American representative to the Calcutta jockets, T/5 George Hearsey. That Hearsey is the only "American" in common knowledge at Tollygunge, and whenever there is a tough, highly spirited horse to ride, the cries go up "let the American ride him," or give him back to Hearsey. Last Saturday was no exception. In the third race, the Garia Hat Plate, 12 horses came out to face the tape and run a mile. Hearsey was on top of "Date Not," a frisky 6 year old, and feared by all the jockeys. It was a difficult race to start and was made more difficult by the use of the continental tape starting system. Dare Not turned nervously round and round in small left-handed circles, and whenever her nose pointed towards the tape she would rear and try to throw her rider. After fully 5 minutes of practice starts the tape went up. Dare Not reared and Hearsey found himself in last place. Two horses were left at the start. It was a hard fast race; in the final stretch Dare Not was still behind but she was gaining steadily and rapidly; she was fourth, moved to third and then to second place, finally came along side of the leader "Salim," but there wasn't time and Dare Not finished second beaten by a head. Hearsey rode a clever race and was trying all the way but the bad start was too much to overcome. T/5 Jockey George Hearsey stems from Waco, Texas, and contrary to the tall lanky Texan, he is a small saddle-built man standing 5'5" high and weighing 115 lbs. 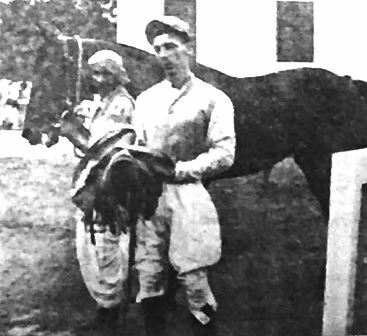 He has always been a horse fancier and when the opportunity arose for him to ride here in Calcutta he grabbed it. Daily he gets up with the dawn, and in the cool of the morning he is usually seen exercising 7 to 9 horses. In the afternoon, when the sun is directly overhead, he dons his long woolen underwear, a heavy pair of OD's and covers all with a field jacket and then goes out to exercise himself. Saturday is the big day when he often rides three or four mounts in the main events. Saturday afternoon Hearsey will be in the saddle in four races. Jockey Hearsey feels that second place is not good enough and that the only well run race is a winning race. The Red Cross never came here. This Chinatown of Calcutta is no tourists' Nirvana of streamline chop suey joints and joss-in-the-bowl. It is a world behind the shutter. In the tight old days of war, the GI's who wandered this way braving a fearsome panoply of "Off Limits" signs in the process, laid themselves open to be sapped or knifed any night of the week. In this bad brawling snuggery of hop-happy celestials, the leitmotif, since a leitmotif there must be, is opium. Last night, in company with a small force of Calcutta's Chinatown Squad Police I saw Charley Wong smoke opium. He sprawled on a faded rattan mattress in the failing light of a dim boom. We brought him out of the clouds where he dreamed happy dreams to show us how it was done. strength of so many pipes, 186 registered dens within less than a mile of us here at the Hindusthan Building. Into the smoky wavering flame of the little oil-lamp beside him, Charley Wong thrust a little red ball of something that winked and bubbled like sealing wax, impaled on the tip of a woman's hat pin. From time to time he dabbed it in a little phial of guava juice flavouring it to make it more palatable. Presently it was "cured" enough to pass muster. The pipe is a long out-of-this-world contraption like a cycle pump. It has a curved mouthpiece with the bowl emerging about half way down the stem. Brother Wong lies down on his side, his head rested lightly on a hard wooden block, the opium ball nestled tightly in the eyelet of the pipe bowl. The pipe is now inverted over the flame of the lamp. And Charley Wong begins to draw deeply, regularly, a long drawn-out distressing sound like a nag with the strangles. The smoke begins to rise in the narrow stuffy den, thick, yellow, unforgettably powerful - a smell like nothing in this world . . burning blankets? . . poppies? . . . and the labored breathing goes on, until abruptly the smoker wrenches himself upright. The pipe is over. The little ball, heated to extremity, has popped off the pin and the session will begin all over again, it needs around three hours smoking to get desired effect. When we ask him what the dreams are like he grins and all we can get out of him is "Aeha." He is 30 years old, a one-time doorkeeper in a gaming house. You look at the dulled gleam in his eyes and straightway you know him as an addict. That way you always know them. Tiny caverns of light in the blackness, you see them everywhere, the sprawled figures, the winking balls, the arm upflung like a restless kid's stretched across the forehead. Maybe its all they've got in this stinking wilderness of cesspits and garbage heaps - maybe three rupees for a phial of opium can fetch the world. An then, as old man Kharyam would have said it, "wilderness is Paradise now." 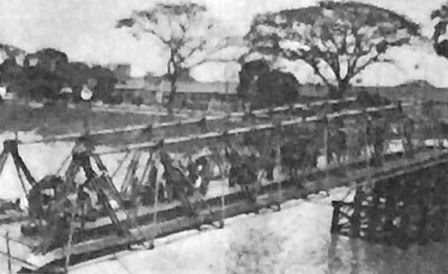 With the balance of the I-B's April 30 category men aboard, the General Hersey pulled silently away from Princep Ghat No. 1 docks in Calcutta last Easter Sunday evening at 3:30 p.m. with 3,284 passengers sailing for New York. The Hersey is carrying a variety of voyagers inside her steel-plated hull, 29 Army nurses, 34 Red Cross girls, 4 Red Cross men, five fare-paying civilians, two civilians on War Department orders, 109 Army patients, besides about 2,000 enlisted men and officers along with military personnel on PCS. Practically all of the ARC girls in the Theater boarded the Hersey Sunday. Only a few remain behind to operate the Burra Club on Dalhouse Square in Calcutta. The Hersey's advance party began boarding at midnight last Saturday. Early Easter _______ trucks from Dum Dum ___ pulled up at the docks and unloaded fatigue-clothed, duffle bag-lugging GI's and khaki-clad B-4 bag-carrying officers. Later truck convoys from Camp Tollygunge and ______ from Replacement Depot No. 3 finished and the cloudy Easter morning's loading schedule. Early in the afternoon patirnts from the 142nd General Hospital arrived followed by the nurses, the ARC gals and civilian passengers. The loading was rather quiet. 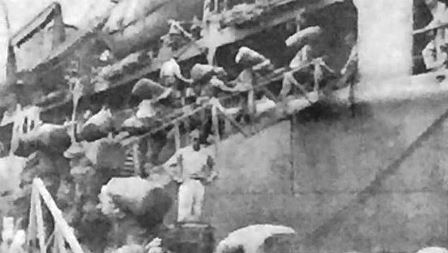 After piling off the trucks, the GI's stood patiently, and somewhat anxiously in a long line in front of the dock waiting to board ship. It was just another line among many to come for the homeward-bound men. They would pick up their bags, carry them a few feet, and drop them when the line stopped again. After crossing the small bridge they gave their names to an Embarkation and Debarkation GI clerk who checked them off the passenger list. After a short walk on the loading platform out in the Hooghly River alongside the Hersey, the GI's picked up their bags for the last time in India and lumbered up the gangplank. There were fans in the troop compartments, but not too effective. The showers on the Hersey and the lavatories were salt water. Not too many water-coolers were noticed. The men wore theur canteens when boarding ship. After dumping their equipment beside their bunks and getting properly situated most of the GI's returned topside and watched the others board ships, chatted with each other, and in general speculated over their approaching voyage and subsequent civilian life. Quite a few reminisced over their military life in India and nearly all agreed that there would be plenty to talk about when they reached their neighborhoods. Perhaps the most ironic GI comment of the day was the greeting a soldier about to board ship yelled to a pal already on deck above him, "Where's that plane at, buddy?" Evidently someone's plans had not been successful. Theater Commander Maj. Gen. Vernon Evans visited the docks while the men were loading Sunday morning. Others, including a few of the local feminine population, presented a few interesting farewells. The Easter Sunday sun was just going down when the ship cast off its lines. It had been a cool, cloudy day with occasional showers from the unusually early or late Bengal rains. There were mixed feelings aboard the General Hersey as its gray-blue hull started down the Hooghly. But not a complaint was heard - yet. WASHINGTON - (UP) - Under-Secretary of State Dean Acheson, testifying this week before the Senate subcommittee on immigration in hearings on the House approved bill to allow a quota of immigrants from India to enter the United States each year, urged that the bill be "favorably reported and promptly passed." Acheson pointed out that he was testifying "to express the full enthusiastic and wholehearted support of the Department of State" of the bill under consideration. He described the bill as "most important and one which will have a very far-reaching effect upon the relations of this country and the great peoples of the Far East." SHANGHAI - (UP) - Four Japanese Army officers convicted of executing three Doolittle Raiders of Tokyo were let off last week with prison terms of five to nine years, the U.S. military commission acknowledging that they merely carried out orders from higher ups. It decided that Japan's special punishment act aimed at Allied airmen comprised "unusually strong mitigating circumstances" in the case. The Burra Club program will be on a day to day planning basis from now until the date of closing on May 15. Several of the successful weekly features requiring limited Red Cross personnel such as the movies and the Cabana Room cabaret dances on Thursday nite will continue as in the past. Along with the tremendous reduction of GI's in this Theater there has been a proportionate drop in Red Cross workers which will seriously handicap club activities. Marjorie Burke, director of Burra Club programs, tells of the difficulties in getting sufficient participants necessary to encourage large and costlier events.